With multiple online therapy platforms available on the market, it can be hard to get a sense of what each one offers. Here’s a breakdown of the two most commonly used platforms: BetterHelp and Talkspace. The BetterHelp intake is a fairly comprehensive series of questions, with helpful guidance and explanations. Within 24 hours of completing the BetterHelp questionnaire, its algorithm matches you with a licensed counselor. If you don’t feel like your therapist is a good fit, you can easily request a new one. For immediate responses, it’s best to schedule a phone, video, or live chat session in advance. When you sign up for Talkspace, the intake process is relatively quick. After answering a few required questions – e.g., What led you to seek help today?” – you have the option to skip ahead and view potential therapists. With Talkspace, users have the option to skip ahead to see potential therapist matches. The platform’s algorithm instantly pairs you with several therapists licensed in your state, and you select your therapist from that short list. Once you’re matched, you’re granted access to a secure, private “room.” This is where you can send messages to your therapist 24/7, via text, video, or voice. Answers aren’t necessarily immediate; unless you have a plan that allows you to schedule live sessions, therapists respond during their own set business hours, five days a week. Similar to BetterHelp, if you don’t feel like your therapist on Talkspace is a good fit, you can easily request a new one. 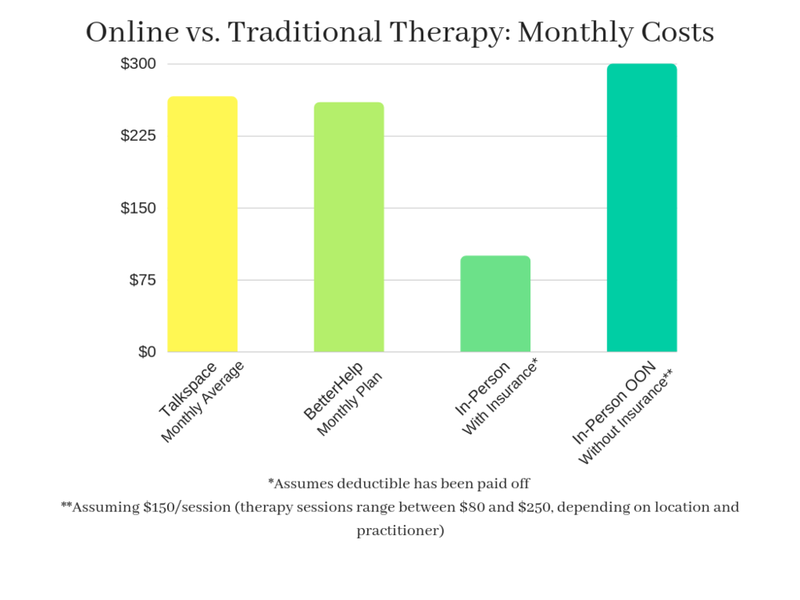 Both BetterHelp and Talkspace provide affordable, accessible plans for online therapy. Both plans allow users to send unlimited messages to their therapists. However, only BetterHelp allows users to arrange for unlimited live sessions with their therapists. At Talkspace, live sessions are limited to premium plans. Although the overall cost of BetterHelp and Talkspace are similar, the platforms have different pricing structures for their plans. All plans with BetterHelp include unlimited text messaging and live text, phone, and video sessions. Pricing for BetterHelp depends on the duration of the plan you commit to. There are also financial aid options for BetterHelp. All Talkspace plans are billed monthly. Their structure is based on therapy type and frequency. Unlimited Messaging Therapy Plus: $49/week (billed as $196 monthly). Includes text, video & audio messaging. Unlimited Messaging Therapy Premium: $59/week (billed as $236 monthly). Includes text, video & audio messaging + 1 Live Session/month. LiveTalk Therapy Ultimate: $79/week (billed as $316 monthly). Includes text, video & audio messaging + 4 Live Sessions/month. All BetterHelp plans include unlimited live messaging and phone sessions. At Talkspace, only the premium plans include live sessions – at the rate of either one or four live sessions per month. 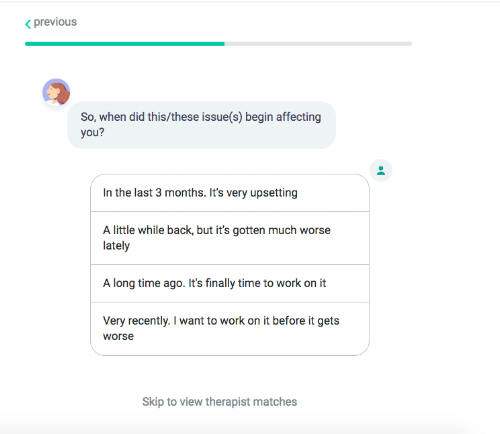 If you prefer having live sessions with your therapist, BetterHelp may be the best fit for you. The platform provides unlimited live messaging and phone sessions. You’ll also have access to therapy without a long-term commitment, since plans can be billed weekly. If you’re looking to commit monthly – and only want text, video, and audio messaging (i.e., don’t need live messaging or phone sessions as much), Talkspace has more affordable options. There’s still a lot of room for research into the safety and effectiveness of online therapy. Until then, see what works best for you! Some of our therapists at Zencare have the option of remote counseling, which can complement your in-person appointments on days when a trip to the office isn’t possible, too. It can be difficult to find therapists who are in-network with insurances, especially in large cities. Here are 7 ways to pay for therapy on a budget when you can't find a therapist who takes your insurance. Looking for affordable therapy services in Manhattan and Brooklyn? Find low cost therapy options for students, LGBTQ folks, veterans, and the homeless provided by non-profits and therapist training institutions.